Someone I follow on Instagram posted a photo of zucchini lasagna, and I was like I have to have that today. It all came together because I happened to have all of the ingredients on hand. Don't you just love when that happens? Zucchini is one of those vegetables that are deceptively full of water. To take the water out, you'll need to salt the ribbons to get them to sweat out the water, and then roast them to further dry them out. Otherwise, your lasagna will be soupy. All the details are in the recipe below, grasshopper. Ground turmeric is a serious superfood. I always add it to ground beef because it's an effortless addition and doesn't change the taste. Always add freshly ground black pepper to turmeric because it helps the body uptake the turmeric and makes it more available for the body to use. But, if you prefer to leave it out, that's totally cool too. Slice zucchini into 1/8" thick ribbons. Lightly sprinkle finely ground sea salt over both sides of the zucchini ribbons & set them on paper towels or a tea towel for 10-15 minutes to allow the salt to pull the water out of the zucchini. This is necessary to keep the zucchini from making your lasagna too watery. While zucchini sweats, set a large frypan over medium heat, add ground beef & 1 tsp. salt. Cook about 5 minutes, or until no longer pink. Add garlic & turmeric to the ground beef & stir for about 1 minute to allow the garlic to cook. Add marinara sauce, basil & pepper and cook until heated through and bubbling. Simmer on low for about 10 minutes, until the sauce has reduced a bit and is no longer watery. Set aside. Using a clean tea towel or paper towels, blot the excess moisture from the zucchini. Line 2 cookie sheets with parchment paper & arrange zucchini ribbons on top. Roast zucchini for approximately 15 minutes, or until just starting to brown. Remove from oven. Set aside to cool. In a medium bowl mix ricotta cheese, parsley, parmesan cheese, and egg. Stir well. 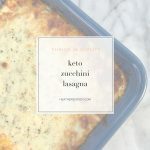 In a 9" x 9" or 10" x 10"square baking dish alternate your ingredients according to this pattern starting at the bottom: 1/2 of the meat sauce, 1/2 of the zucchini to cover, 1/2 of the ricotta cheese mixture, 1 cup of the mozzarella cheese. You should have two layers of each with the final layer of mozzarella on top. 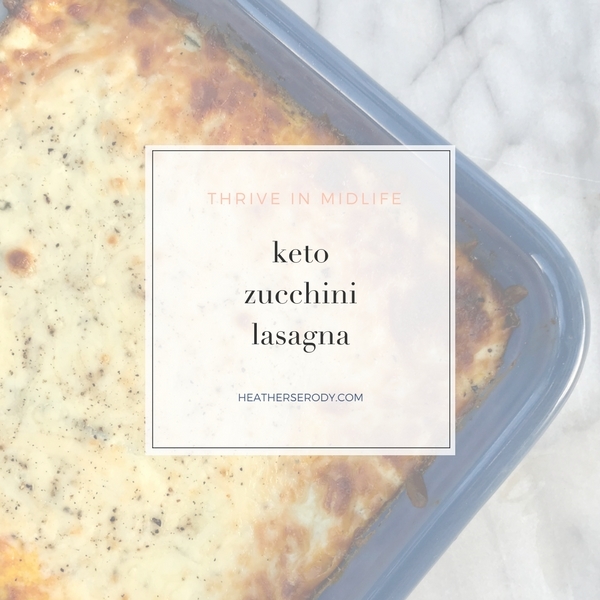 Bake uncovered with a sheet pan underneath to catch any spills for approximately 30 minutes or until warmed through & bubbling & the top layer of cheese is melted and just starting to brown. 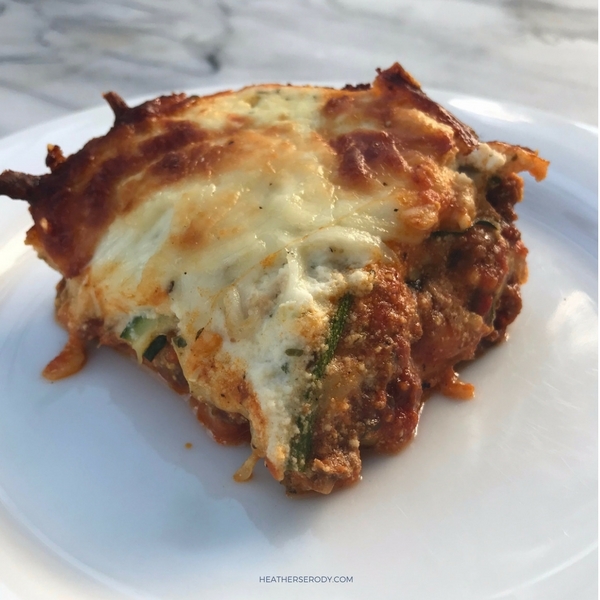 Allow lasagna to cool & set for at least 10 minutes before serving. Garnish with additional parmesan cheese, if desired.